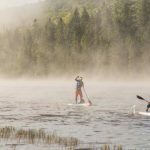 He embarked on this mission with 120lbs of gear, to be carried on a 16’ Starboard inflatable SUP, for which he built an inflatable bed. The weather was however not in favor of a crossing, there was still too much ice and winds were not right, so the crossing could have easily lasted 10 instead of the planned 5 days. 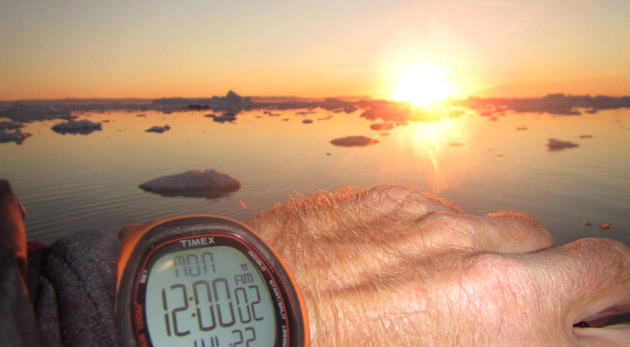 He adjusted his plan and paddled in Greenland instead, from Ilulissat to Asaiaat. Check out the totally amazing video and read his story below. 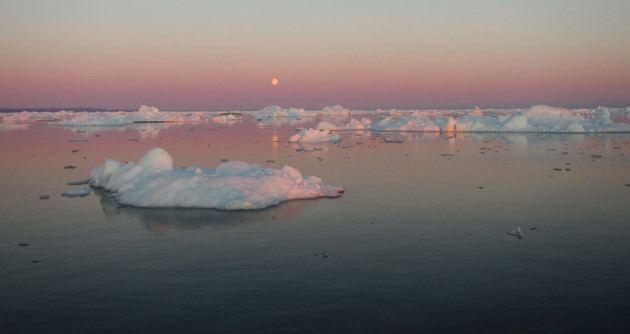 “Most fishermen, who had never seen a Stand up paddleboard before, were watching, when I made my first paddles strokes out of the Ilulissat’s little fishing harbor. They had been very shy and didn’t ask many questions, looked at me and smiled when I was still preparing to leave. I was packed with food and water for 8 days, safety gear, navigation equipment, my ‘sup bed’ and plenty of warm clothes. 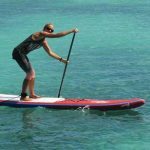 I was using a 16’ Starboard inflatable, which had been easy to get on the plane with me all the way from Maui and change the way we can explore, now almost any destination you can go and use a SUP. Today was a perfect arctic day with blue skies and fresh but decent temperatures. In front of me was a 15-mile field of ice and icebergs. 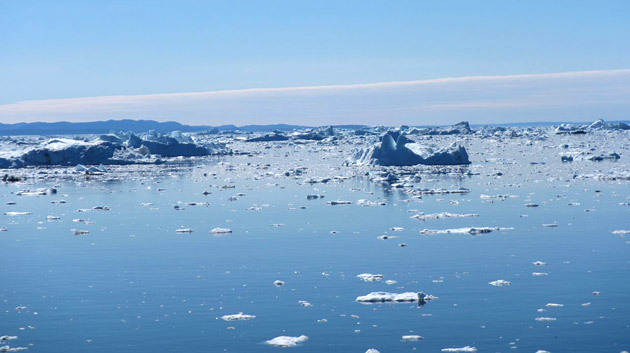 Ilulissat, which means Iceberg in Greenlandic is situated next to the most producing glacier in the Northern hemisphere. 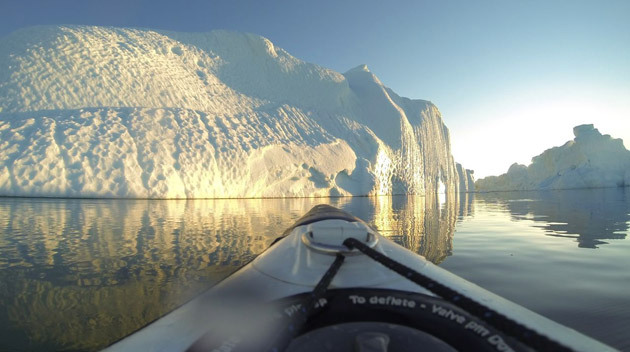 50 meters a day and 20 billion tons every year calve of the glacier and I was paddling right between those icebergs. Ice was everywhere. I had to work hard to find a way through it. On windy days this would be a very dangerous task, and a big risk of being crushed by the ever-moving ice. Paddling between the icy giants was very fascinating and in the beginning almost frightening at the same time. Every minute you would hear a loud, sometimes thunder like, sound of an iceberg breaking off which sometimes set a whole set of movements in motion. I saw a small piece break off after which the whole 100 ft tall iceberg turned upside down in a slow motion. Or an even taller iceberg totally collapsed and created waves that could easily throw you over. I paddled and took photos until well after midnight. The last few hours was an endless sunset and then just when you think it will set, the sun starts to rise again. At 2am I was just outside the ice field. From now on only the big icebergs remained which were spread apart in front of me. It was another 50 miles to Aasiaat , the next small town. But I was tired of all the paddling and excitement and it was time to go to sleep. Soon after I tried to sleep, I realized the bottom of my bed had a leak. Without any insulation between the wet board and me, it was cold. Too cold I soon realized. On top of that the wind picked up even more and because of all the icebergs the sea state was very unorganized, rocking me in every direction. Soon I was seasick and cold. There was nothing better to do than pack my bed together and start paddling again to get warm. This time with gloves and a hoody over my head, I soon was warm again, but I still felt miserably seasick, even had to throw up. Other than most people, after sailing for many years, I can handle seasickness. Basically, you feel sick, throw up, wait 5 min, eat and drink to refuel what is lost and do this until you start to feel better. On a ship this might take a few days, on a board mostly I am ok after half a day. On this trip my friend Tom Hammerton was supplying me with a daily weather forecast, which I could check on my satellite tracker, that received messages as well. 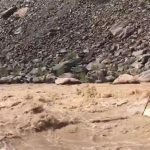 After studying the weather in this region for the last couple of months, I noticed how fast things change and that you couldn’t rely on a forecast longer than 2 days ahead. This should have been a crossing between Canada and Greenland. But in Canada, where I was supposed to leave was still a 15-mile layer of ice and with 4 low-pressure systems in the area the weather looked very risky. On top of that, after testing my board the last weeks, my speed of the inflatable board with 120llbs of water, food and gear wasn’t what I hoped for. It suddenly could be a 10-day adventure instead of a 5 day crossing, with water temperatures close to freezing. I decided that it was not worth risking my life. Life is too beautiful. Every now and then I would see some whales close by, but they would always stay at a distance. It was mostly Atlantic Humpback whales, obviously not bothered by the cold water. I was loving my new drysuit from Supskin, which had been so much more comfortable than the wetsuit I had been paddling in on other trips. It is made of a breathable material and is very light and most important of all I could wear anything I would like underneath. I tried to eat every hour some food and little by little the seasickness was going away. Every mile or so, I would pass by a giant iceberg, tall as a building and in a different shape every time. 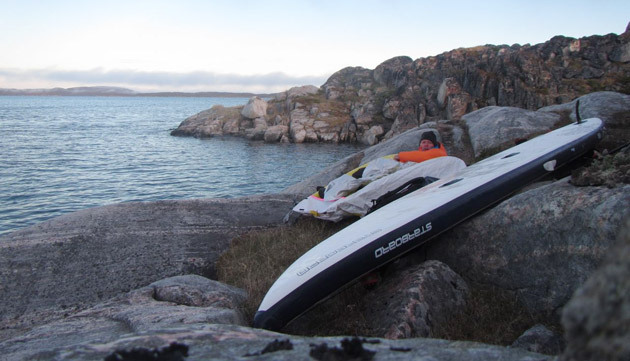 After almost 24 hours of paddling I could see my destination and I was getting closer to the island in front of Aasiaat. The wind died completely which made it a lot easier to spot the many whales and seals. The seals would curiously pop up their head high out of the water and look around to see who was coming their way, though quickly disappearing when they saw me. Finally at 9 at night, after 28 hours I arrived in Aasiaat, a small town with a harbor and one of the few airports in this area. I called my wife on the satellite phone and told her that I was tired, but felt good and would continue along the coast, depending on the weather. The following day it was sunny, but also windy from the South, the direction I was going. I started paddling and almost gave up right away. I was doing about 1.5 knots. With this rate I would never get to Sisimiut, which was still 120 miles away. 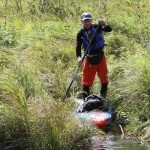 In the next days I paddle little by little South, moving from one small camping spot to the next. Sometimes I slept in forgotten villages of 3 houses, where the owners left a long time ago to the ‘bigger’ towns with more facilities. After a week on the board paddling between Ilulissat and Attu, I got to Kangaatsiaq, a town with 460 inhabitants, big enough for a supermarket with incredible Danish pastry and a little harbor where I found a fisher who gave me a ride Aasiaat where I checked into ‘The Seaman Hostel’. The last days the weather had been a little overcast with a few showers, but now it was pouring and the temperatures dropped even more. Inside my little room it felt ridiculously warm, but maybe it was me, maybe I started to get used to this harsh weather here. The next 2 days during my 7 flights to get back home to Maui, I had plenty of time to reflect the last 2 weeks. This Arctic Expedition was only possible with the help of my main sponsor STARBOARD who supported me over the years in many ways. Sponsors: SUPSKIN drysuits, PATAGONIA, MAUI JIM’s, POCKETFUEL BLACK PROJECT FINS .